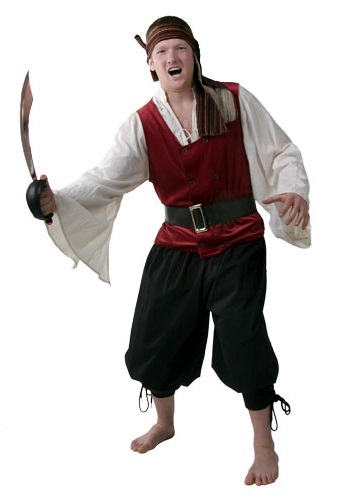 This simple pirate costume is a realistic look from the historical pirates of the high seas. The costume includes a cotton/gauze ivory shirt that ties at the chest and features over sized sleeves that are open until the elbow for a historic touch of fashion. The burgundy vest is velvet with eight buttons down the front. The black polyester pants have an elastic waist; they are baggy at the thigh and hip, but form-fit at the calves with ties at the sides for a unique pirate look. Add to the authenticity with the striped bandana, black belt with large buckle and of course, pirate sword! This pirate look stays true to the swashbuckler look from the past.